Hudson Exchange brings you a heavy duty UN rated HDPE Hedpak container. This container is designed with HDPE plastic to help resist chemical degradation. Perfect for shipping liquids. 63mm white polypropylene cap features a polyethylene foam liner for a tight seal. Package consists of 2 containers and 2 caps. Hudson Exchange brings you a heavy duty UN rated HDPE Hedpak container. This container is designed with HDPE plastic to help resist chemical degradation. Perfect for shipping liquids. 63mm white polypropylene cap features a polyethylene foam liner for a tight seal. 4 pack; package consists of 4 containers and 4 caps. Transport your homebrew with ease with the help of this 1-gallon glass jug. 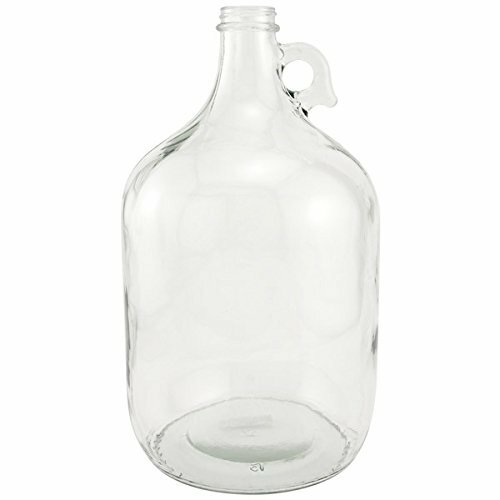 Made of clear glass with a finger loop carrying handle, this jug holds a full gallon of your favorite happy homebrew. Of course, in a pinch, you can also use it as a regular growler (just remember that it holds twice as much!). In stock and ready to ship. Features: Made of glass. Convenient finger loop carrying handle. Does NOT include 38mm caps. Specs: Capacity: 1 gallon (128 oz. )., Set of 4 glass jugs, One gallon glass jugs, Does NOT include38mm polyseal caps, Country of origin - United States, Manufacturer name - Home Brew Ohio. 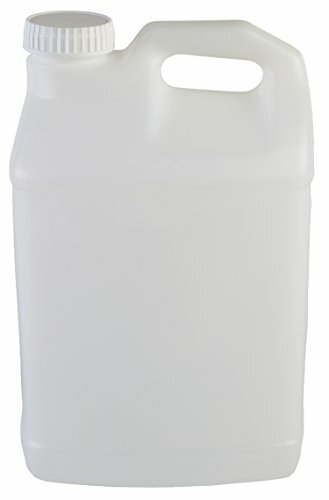 Hudson Exchange brings you their 2.5 gallon (10 liter) heavy duty HDPE handled container with cap. FDA approved resin is safe for food and water contact. Containers are stackable for easy storage and transport. Conventional handle is attached for quick pours and easy use. 60mm neck finish, red cap included. Blue color. This 1/2 inch all-plastic fitting permits retrofitting of most Nalgene and other manufacturers' closures for liquid transfer. Unique autoclavable fitting with two barbed ends is useful wherever tubing must be attached on both ends. Comes with complete directions and template for installation. Gasket and nut assemblies provide leakproof service. Can be sterilized by autoclave gas or chemical methods. Fits tubing with an inner diameter of 1/2 inch. DImensions: overall 2-1/2 high x 1 inch width. Size: 1/2 inch. Assembly material: (2) polypropylene fittings (2) acetal nuts (2) silicone gaskets and (1) TPE port cap. Nalgene #: 6149-0001. The EZwaste UN/DOT System is designed to be an affordable solution for liquid waste disposal. Our containers are made tough and durable. 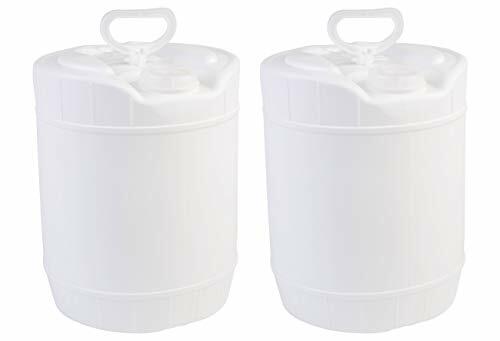 They are great for secure shipment and storage of liquid products. 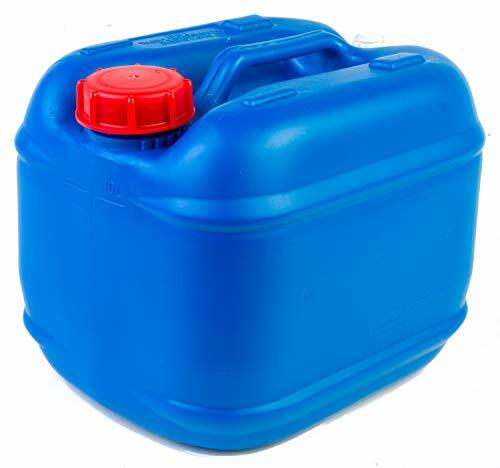 The UN/DOT container is available in 13.5L, 20L and 60L. Each comes with a 70mm cap. These containers can also be used in other industries including, but not limited to: sanitation, chemical, agricultural, and food. All raw materials used in our containers meet Standards for food contact. 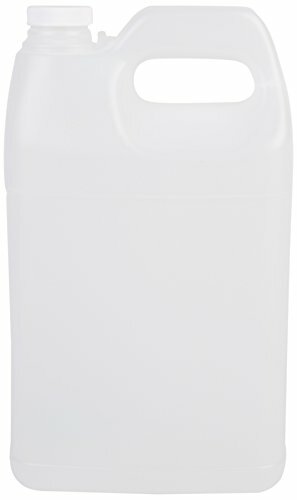 Unique heavy-walled polyethylene container has an 83 mm and 38 mm opening for filling in either the vertical or horizontal position. No-leak faucet can be positioned independently of its screw cap. Smaller faucet extension permits easy filling of small-neck containers. Large comfortable handle and hand grip in rear. Embossed with and 1 gallon graduations. 5 gallon capacity. 7/16" OD Outlet Spigot. Spigot is included inside the container, there are two caps,the spigot is inside the big one. Vestil rectangular carboy with stainless steel handle. General-purpose use carboys with rugged design for use in industrial and commercial applications. Carboys are constructed of natural colored FDA compliant high-density polyethylene. Not designed for use with gasoline, diesel or kerosene. 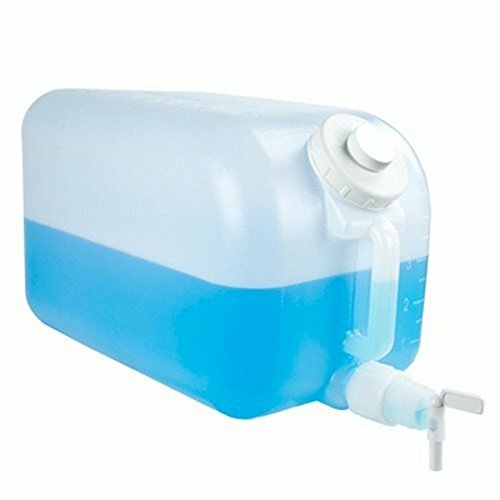 Rectangular wide-mouth carboys are designed for easier filling and cleaning. Stainless steel handle is standard for easy, ergonomic transport. Molded in graduations listed in gallons. 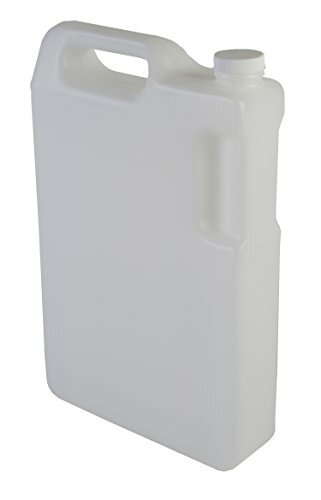 The 5 liter Hudson Exchange hedpak container is constructed of heavy duty hdpe plastic. Included is a 38mm white polypropylene cap with a pe foam liner for a tight seal. Features a convenient carrying handle. accepted plastic. Pack of 4 hedpaks. 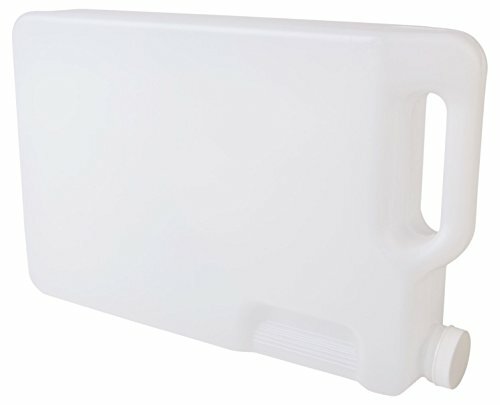 Hudson Exchange brings you a heavy duty Winpak for transportation liquids and chemicals. Heavy duty HDPE (high density polyethylene) plastic resists chemical degradation. 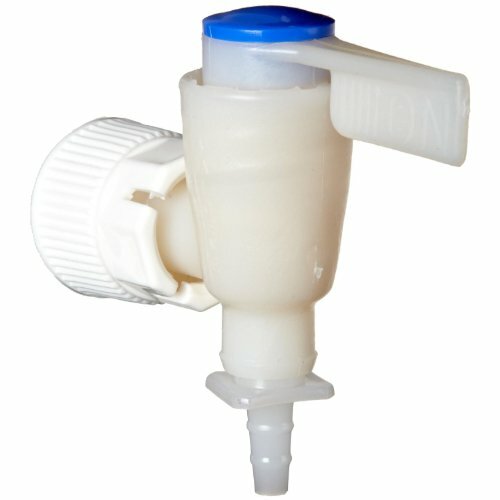 70MM Rieke cap has a 3/4" thread, ready to accept a Rieke or generic faucet. To use a faucet the plastic tab has to be knocked out. Handle is attached for easy pours. 5 gallon capacity. FDA accepted. The most time consuming and most important step in making beer or wine at home is cleaning and sanitizing. 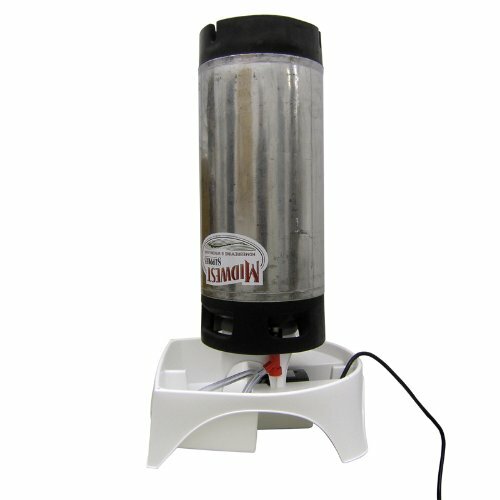 The mark II keg Washer reduces the time it takes to clean and sanitize your kegs, carboys, and buckets (also comes with hose cleaning adapters). simply fill the reservoir with cleaner or sanitizer, place the vessel over the sprayer, and plug it in. This great automated device frees you to complete other tasks while it works. Save on cleaning and sanitizing chemicals, by spraying the solution on the entire inner surface you use less, saving water and chemicals. The reservoir also contains space to soak small items like airlocks and stoppers. The mark II keg Washer should be the first piece of equipment you set up and the last you put away. 7 stopper for 5 gallon glass carboy. 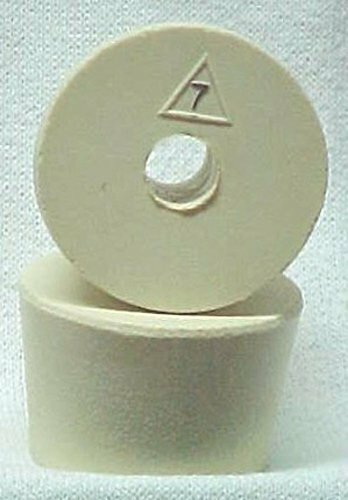 #7 stopper for 5 gallon carboy (Qty. 5), country of origin - Canada, manufacturer name - SoCal Homebrew. Simply blow into the sterile filter, which slightly pressurizes the carboy, causing beer to flow out. Attach the sterile Siphon starter assembly by firmly pushing the orange or yellow carboy hood over the mouth of the carboy. Slide the stainless racking cane to the desired depth, just about the sediment level and blow into the white, sanitary air filter for 2-3 seconds. Blowing through the filter forces beer out through the racking cane, starting the Siphon. There is no need to worry about contamination from your mouth, as the sanitary filter removes 99.98 percent of airborne bacteria. 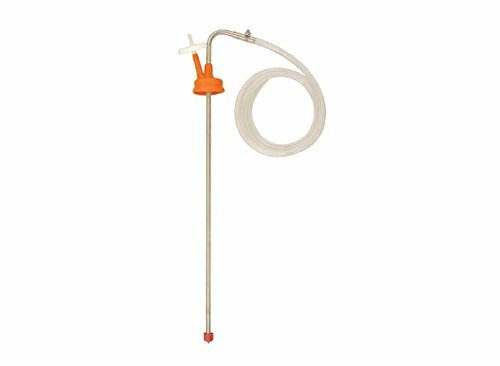 Sterile Siphon includes: 26 inch stainless racking cane red sediment reduction tip orange carboy hood for 5 gallon Carboy5' 3/8 inch ID vinyl tubing stainless hose clamp sterile air filter about the white sterile filter: there are two sides to the filter - an "in" and an "out". the direction you use doesn't matter, however, you want to take note of which way you first push air through it and always keep it that way. There is an arrow on the edge of the filter housing that we use to keep the air flow going one direction when using it. The filter should never get wet, so don't try and sanitize it by dunking it in sanitizer. If you want to clean the outside of it, use Alpet D2. To store the filter, use a little tinfoil on the "in" of the filter and store in a zip-lock bag. 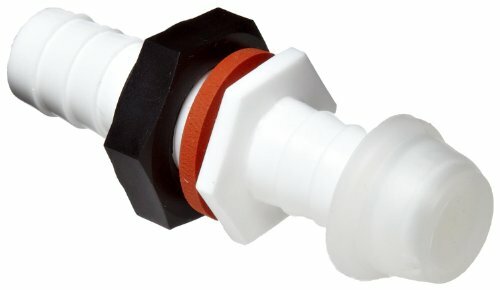 This standard 1-1/8 inch quick action spigot has 12 straight female threads. Used for Nalgene bottles carboys lowboys and clearboys; accepts 5/8 inch (16mm) I.D. tubing. Also includes high-density polyethylene tubing adapter which takes 1/4 inch or 5/16 inch (6-8mm) I.D. tubing. Dissassemble before autoclaving. Materials: polypropylene with high-density polyethylene tubing adapter. Size: 1-1/8 inch. 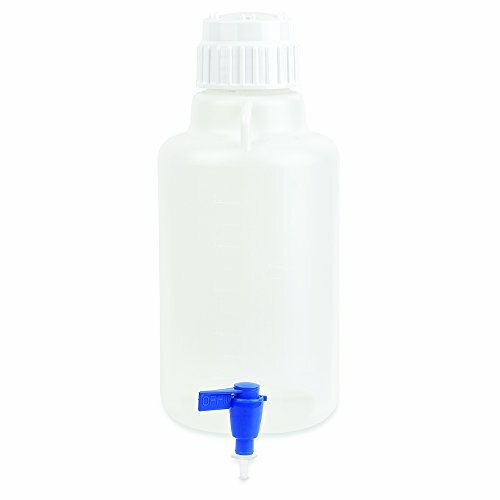 Nalgene #: 6422-0010. Karter Scientific Round Carboys with Screw Cap are manufactured from polypropylene material. Featuring molded graduations, spigot and PP screw cap. 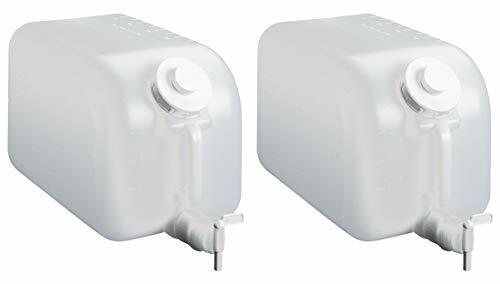 Convenient wide shoulder handle; suitable for collecting and dispensing liquids. Vestil rectangular jug is for use in industrial and commercial applications. 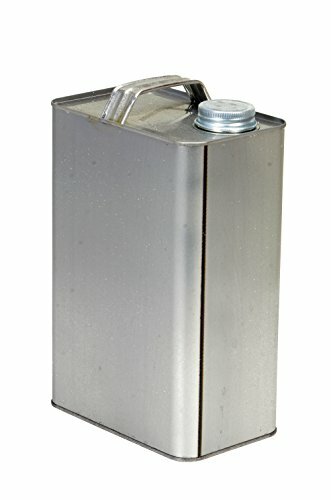 Ideal for storing or transporting a variety of liquids. Tin-plated steel construction with threaded steel closure. Measures 4-1/8-inches length by 6-19/32-inches width by 10-3/8-inches height. 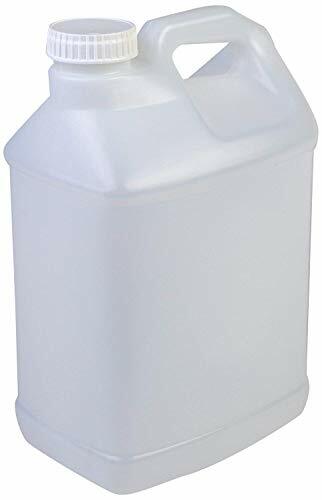 These 1 gallon containers are extremely tough. Made of hdpe resin, the containers will resist many chemicals. Each cap is a 38mm white polypropylene cap featuring a polyethylene foam liner for a tight seal. Package includes 6 containers and 6 caps. Natural color. Saves Time: Large fill opening allows full 2. 5 gallon fill in vertical or horizontal position - embossed gallon scale to gauge content on 5 gallon only. Improves Safety: Heavy-duty faucet assembly is leak free. Saves Space: Designed to be stored and filled while placed in Tolko Space Station rack system to save valuable floor space. Applications: Storing and dispensing pre-mixed cleaning chemicals or chemical concentrates. Compatible with most cleaning solutions. Do not use with solvents or corrosive chemicals. See Space Station Racks for storage options. 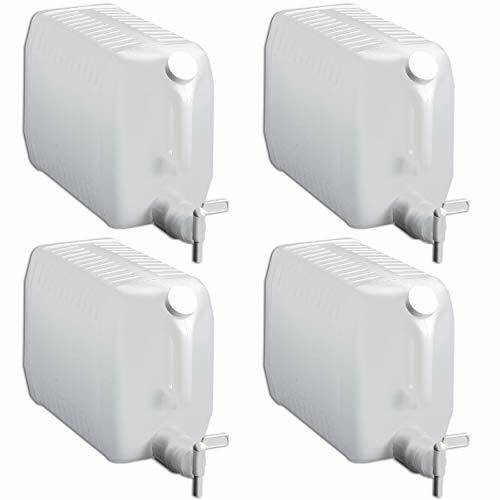 4 pack, carton contains 4 carboys. 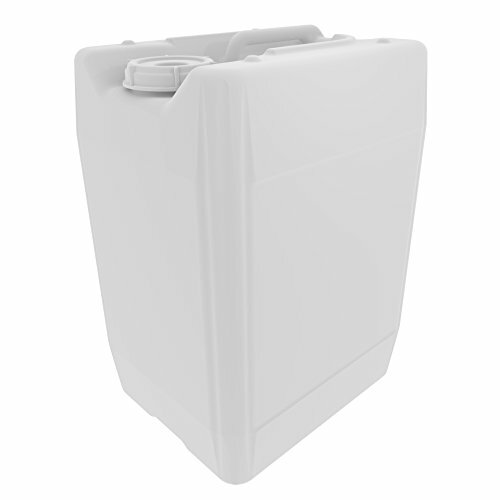 The 5 liter Hudson Exchange Hedpak container is constructed of heavy duty HDPE plastic. Included is a 38mm white polypropylene cap with a polyethylene foam liner for a tight seal. Features a convenient carrying handle.